Alt stands for altitude and Az stands for azimuth. Altitude in this sense is the angle in degrees that an object appears in the sky above the horizon. Azimuth is the compass direction in degrees with 0 degrees representing North, 90 degrees East, 180 degrees South, and 270 degrees West. Using these two coordinates you can place an object in the sky. This is a simple plot. 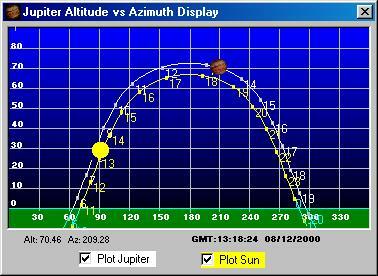 A trail appears for the path of Jupiter or the Sun throughout the day, with the obvious icon representing the actual position of the body in real or fixed time. You may select which object(s) appear with the checkboxes. Time marks are found along the path lines with hours marked in the selected time system.